Marxist philosophy or Marxist theory are works in philosophy that are strongly influenced by Karl Marx's materialist approach to theory, or works written by Marxists. Marxist philosophy may be broadly divided into Western Marxism, which drew out of various sources, and the official philosophy in the Soviet Union, which enforced a rigid reading of Marx called dialectical materialism, in particular during the 1930s. Marxist philosophy is not a strictly defined sub-field of philosophy, because the diverse influence of Marxist theory has extended into fields as varied as aesthetics, ethics, ontology, epistemology, theoretical psychology and philosophy of science, as well as its obvious influence on political philosophy and the philosophy of history. The key characteristics of Marxism in philosophy are its materialism and its commitment to political practice as the end goal of all thought. The philosopher Étienne Balibar wrote in 1993 that "there is no Marxist philosophy and there never will be; on the other hand, Marx is more important for philosophy than ever before." So even the existence of Marxist philosophy is debatable (the answer may depend on what is meant by "philosophy," a complicated question in itself). Balibar's remark is intended to explain the significance of the final line of Karl Marx's 11 Theses on Feuerbach (1845), which can be read as an epitaph for philosophy: "The philosophers have only interpreted the world, in various ways; the point is to change it". Marx develops a comprehensive, theoretical understanding of political reality early in his intellectual and activist career by means of a critical adoption and radicalization of the categories of 18th and 19th century German Idealist thought. Of particular importance is Hegel's appropriation of Aristotle's organicist and essentialist categories in the light of Kant's transcendental turn. (a) Hegel adopts the position that chance is not the basis of phenomena and that events are governed by laws. Some have falsely attributed to Hegel the position that phenomena are governed by transcendent, supersensible ideas that ground them. On the contrary, Hegel argues for the organic unity between universal and particular. Particulars are not mere token types of universals; rather, they relate to each other as a part relates to a whole. This latter has import for Marx's own conception of law and necessity. (b) In rejecting the idea that laws merely describe or independently ground phenomena, Hegel revives the Aristotlean position that law or principle is something implicit in a thing, a potentiality which is not actual but which is in the process of becoming actual. This means that if we want to know the principle governing something, we have to observe its typical life-process and figure out its characteristic behavior. Observing an acorn on its own, we can never deduce that it is an oak tree. To figure out what the acorn is - and also what the oak tree is - we have to observe the line of development from one to the other. (c) The phenomena of history arise from a whole with an essence which undergoes transformation of form and which has an end or telos. For Hegel, the essence of humanity is freedom, and the telos of that essence is the actualization of that freedom. Like Aristotle, Hegel believes the essence of a thing is revealed in the entire, typical process of development of that thing. Looked at purely formally, human society has a natural line of development in accordance with its essence just like any other living thing. This process of development appears as a succession of stages of world history. Human history passes through several stages, in each of which is materialized a higher level of human consciousness of freedom. Each stage also has its own principle or law according to which it develops and lives in accordance with this freedom. Yet the law is not free-standing. It is delivered by means of the actions of men which spring from their needs, passions, and interests. Teleology, according to Hegel, is not opposed to the efficient causation provided by passion; on the contrary, the latter is the vehicle realizing the former. Hegel consistently lays more stress on passion than on the more historically specifiable interests of men. Marx will reverse this priority. 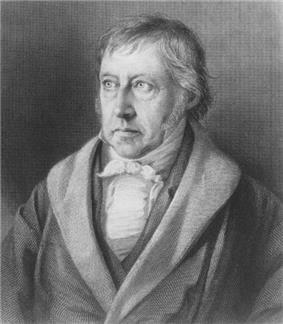 Hegel distinguishes as Aristotle did not between the application of organic, essentialist categories to the realm of human history and the realm of organic nature. According to Hegel, human history strives toward perfectibility, but nature does not. Marx deepens and expands this idea into the claim that humankind itself can adapt society to its own purposes rather than adapting themselves to it. Natural and historical change, according to Hegel, have two different kinds of essences. Organic natural entities develop through a straightforward process, relatively simple to comprehend at least in outline. Historical development, however, is a more complex process. Its specific difference is its "dialectical" character. The process of natural development occurs in a relatively straight line from the germ to the fully realized being and back to the germ again. Some accident from the outside might come along to interrupt this process of development, but if left to its own devices, it proceeds in a relatively straightforward manner. Society's historical development is internally more complex. The transaction from potentiality to actuality is mediated by consciousness and will. The essence realized in the development of human society is freedom, but freedom is precisely that ability to negate the smooth line of development and go off in novel, hitherto unforeseen directions. As humankind's essence reveals itself, that revelation is at the same time the subversion of itself. Spirit is constantly at war with itself. This appears as the contradictions constituting the essence of Spirit. In the development of a natural thing, there is by and large no contradiction between the process of development and the way that development must appear. So the transition from an acorn, to an oak, to an acorn again occurs in a relatively uninterrupted flow of the acorn back to itself again. When change in the essence takes place, as it does in the process of evolution, we can understand the change mostly in mechanical terms using principles of genetics and natural selection. The historical process, however, never attempts to preserve an essence in the first place. Rather, it develops an essence through successive forms. This means that at any moment on the path of historical change, there is a contradiction between what exists and what is in the process of coming-to-be. The realization of a natural thing like a tree is a process that by and large points back toward itself: every step of the process takes place in order to reproduce the genus. In the historical process, however, what exists, what is actual, is imperfect. It is inimical to the potential. What is trying to come into existence - freedom - inherently negates everything preceding it and everything existing, since no actual existing human institution can possibly embody pure human freedom. So the actual is both itself and its opposite (as potential). And this potential (freedom) is never inert but constantly exerts an impulse toward change. 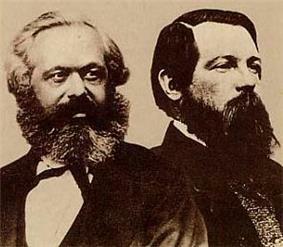 Along with Engels, who observed the Chartist movement in the United Kingdom, he cut away with the environment in which he grew up and encountered the proletariat in France and Germany. He then wrote a scathing criticism of the Young Hegelians in two books, "The Holy Family" (1845), and The German Ideology (1845), in which he criticized not only Bauer but also Max Stirner's The Ego and Its Own (1844), considered as one of the founding book of individualist anarchism. Max Stirner claimed that all ideals were inherently alienating, and that replacing God with Humanity, as did Ludwig Feuerbach in The Essence of Christianity (1841), was not sufficient. According to Stirner, any ideals, God, Humanity, the Nation, or even the Revolution alienated the "Ego". Marx also criticized Proudhon, who had become famous with his cry "Property is theft! ", in The Poverty of Philosophy (1845). In 1844-5, when Marx was starting to settle his account with Hegel and the Young Hegelians in his writings, he critiqued the Young Hegelians for limiting the horizon of their critique to religion and not taking up the critique of the state and civil society as paramount. Indeed in 1844, by the look of Marx's writings in that period (most famous of which is the "Economic and Philosophical Manuscripts of 1844", a text that most explicitly elaborated his theory of alienation), Marx's thinking could have taken at least three possible courses: the study of law, religion, and the state; the study of natural philosophy; and the study of political economy. Some varieties of Marxist philosophy are strongly influenced by Hegel, emphasizing totality and even Fredric Jameson. Others consider "totality" merely another version of Hegel's "spirit," and thus condemn it as a crippling, secret idealism. ^ Meikle, Essentialism in the Thought of Karl Marx, Open Court Publishing Company (1985), 30. ^ a b c d e f g h i j k l m n o p q r s t u Ibid. ^ http://www.iep.utm.edu/durkheim/ ; See section on "The Individual and Society."